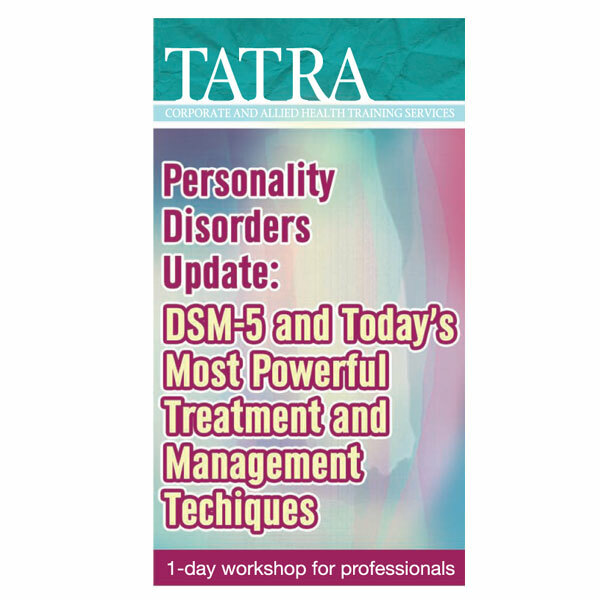 This unique training teaches cutting-edge methods for diagnosing, treating, and managing clients with personality disorders. This workshop focuses on teaching the practical methods that have been found to work successfully with these clients, including methods to repair disordered personality, diminish unproductive behaviours, enhance productive behaviours, and generate appropriate and adaptable behaviours. Despite having familiarity with some specific aspects or models of understanding or treating personality disorders, most professionals find personality disorders to be the most confusing, frustrating, and difficult of all mental health conditions. Fortunately, there have been recent advances in our understanding of personality disorders that offer professionals new, powerful, and highly effective methods for treating and managing these conditions in nearly any mental health, health care, or social service setting. This unique training teaches cutting-edge methods for diagnosing, treating, and managing clients with personality disorders. Drawn on fifteen years of development and from the world’s largest-attended seminar on personality disorders which synthesized the model of understanding personality disorders that has recently been adopted by the DSM 5, in this training professionals will learn the elements common to all personality disorders and the cutting-edge methods that have been found to work to treat and manage them. This workshop focuses on teaching the practical methods that have been found to work successfully with these clients, including methods to repair disordered personality, diminish unproductive behaviours, enhance productive behaviours, and generate appropriate and adaptable behaviours. These methods can be applied across a wide variety of mental health and social service settings, and can significantly improve professionals’ ability to deal effectively with this difficult clientele.